After its orbit insertion on July 4, 2016, NASA’s Juno spacecraft performed its first close approach, or perijove, about Jupiter on August 27, passing only 2,600 miles above Jupiter’s atmosphere. The pass represents the first time all science instruments were on and recording data of the planet, including the magnetic fields instrument suite (MAG). Team ADNET staff are responsible for the creation and validation of MAG command sequences as well as the processing of engineering and science data once the telemetry hits the ground. Data from the MAG will be critical in the testing of models of Jupiter’s magnetosphere and its interaction with nearby moons. 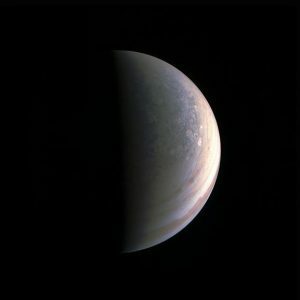 The image showing Jupiter’s north pole was taken by the JunoCam camera while still 120,000 miles away and is the first view of the pole from this angle since Pioneer 11’s flyby in 1974.